This coming Thursday, October 21, Portland folk/Americana quintet Black Prairie (featuring three members of The Decemberists) will be in town for a show at Schubas with locally-based acts Canasta and Honda Pavarotti opening. In honor of the upcoming gig, we have two vinyl LPs of Black Prairie's debut, Feast of the Hunters' Moon to give away for free! If you want to win one of the LPs, shoot us an e-mail with the subject line "Black Prairie" and your first and last name in the body of the message, and we'll select two winners at random. We'll be accepting entries until 12 p.m. on Tuesday, October 19 and will notify the winners via e-mail once the contest has closed. 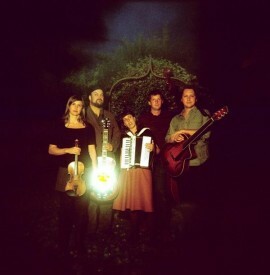 Black Prairie was recently started as a side project by the three Decemberists, who joined forces with two other Portland musicians and released Feast of the Hunters' Moon in the Spring. Check out this NPR article for more details on the group and its formation. Click below to listen to and download three songs from the band.